SALE ALERT: Where to Shop for Christmas Gifts for your loved ones? 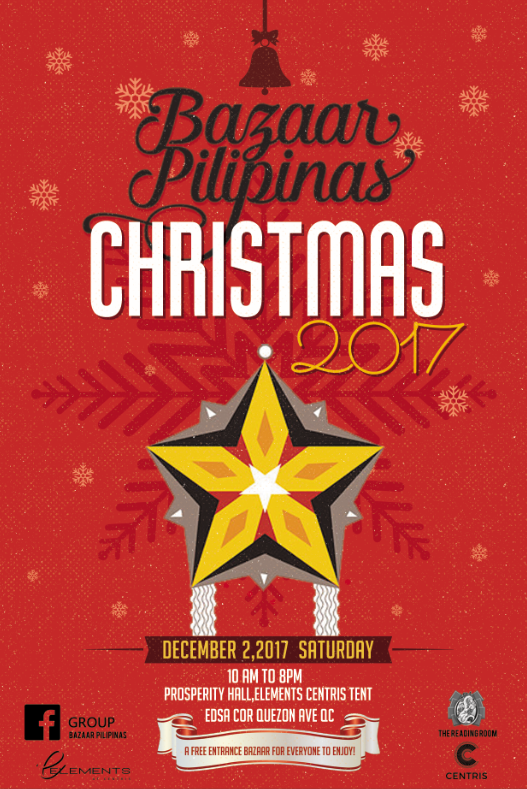 Pasko na! Here we are thinking once more of where and what to gift our inaanaks, pamangkins and all family and friends. Plus all that Christmas parties! In this article I've got a couple of places that are holding up Bazaars to help us with our Christmas Shopping list. The bazaar aims to recognize locally crafted or produced creations, as well as Pinoy entrepreneurs whose businesses are diverse and exciting. 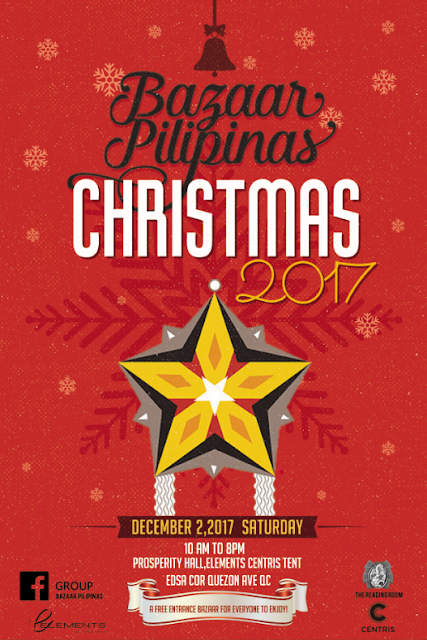 This free-entrance event will have over 120 sellers of various items to sate the Christmas shopper's needs, from fashionable apparel, footwear, jewelries and accessories, to books, toys, sporting goods, decor and collectibles, cosmetic and skin-care products, food products that are as diverse as they are delicious, pet products, small appliances and crafted furnishings. One of their highlights are the arts & crafts merchants they invited,offering their lovely, handcrafted creations made of paper, clay, leather, metal, and so much more. They also have merchants of pre-loved and vintage items to delight even the most discerning bargain shopper! 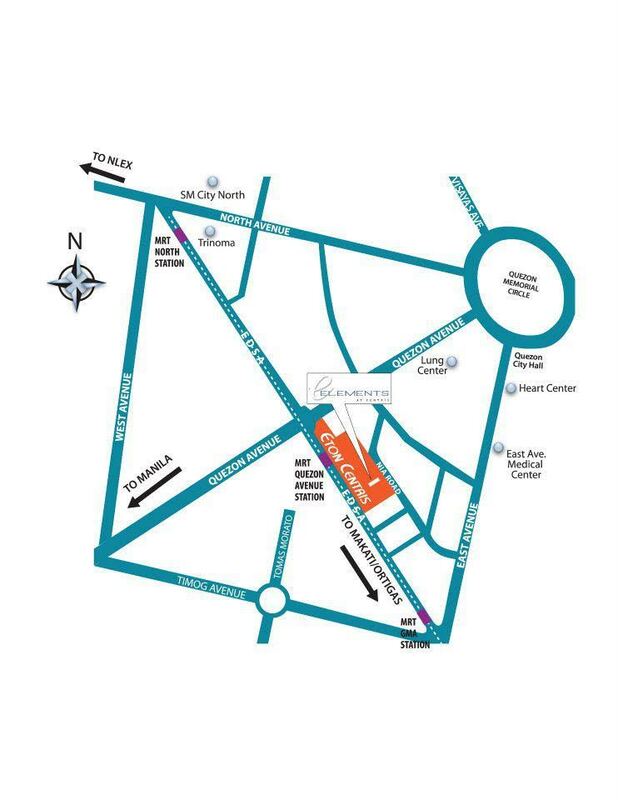 Fill up your Christmas gift list in this one bazaar, situated in the heart of Quezon City. Side note: they welcome your fur babies too, as this is a pet-friendly event. There are also raffle prizes every half-hour to guests to register at the entrance - all you have to do is sign in with your name and Facebook account. No entrance fees will be charged, so bring in your entire family! Parking is not a problem - a brand-new 3-storey parking building is right in front of the Elements Centris tent, to make it even more convenient for you. The venue, ELEMENTS TENT in Centris is situated on EDSA corner of Quezon Blvd., so getting there is not a problem. This bazaar was organized to benefit the group BAZAAR Pilipinas, a community of bazaaristas, merchants & organizers - and in cooperation with The READING ROOM, Cubao X and the administration of Elements Tent, Centris. Enjoy some family time while shopping for gifts with the family at The Promenade Mall. From November 18, 2017 and all weekends until the end of 2017 you can enjoy great discounts of the latest finds and treats fit for every member of the family. Located at the Missouri Entrance of the Promenade Mall, You will be welcomed with a wide array of merchants that will help you ease the stress of holiday shopping on the weekends. Along with the discounts are also the unique and one of a kind stores that will help you buy a special gift for your special someone. Need a gift for your nieces and nephews? They have it here at great prices that will fit your budget. Need to buy your best friend his or her favorite perfume - its only a one stop away! 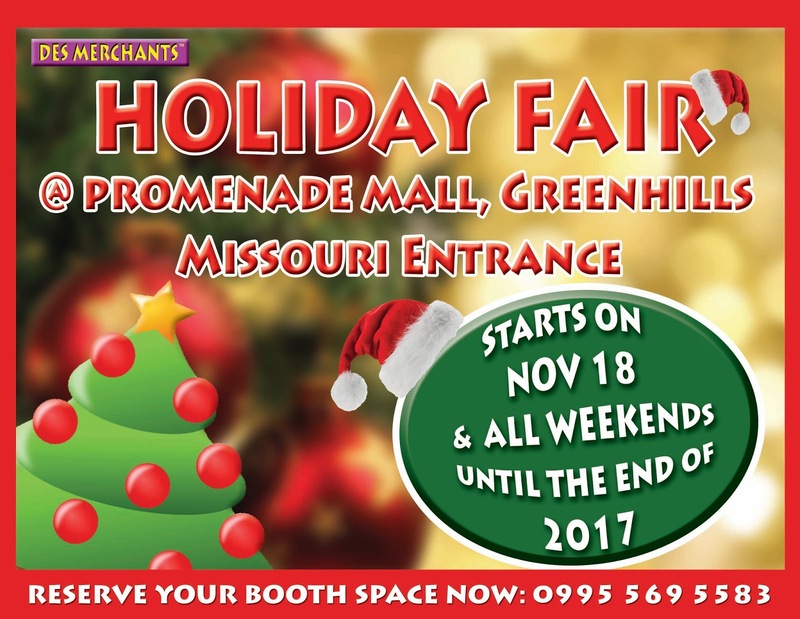 Make sure to drop by the Holiday Fair at the Promenade Mall and have a great holiday shopping experience this Yuletide season. For interested merchants, you may call or text 0995 569 5583 for further details. As Christmas is slowly coming by better make sure to buy your gifts for your loved ones as early as now with Robinsons Townville Solenad 2 Nuvali in cooperation with Des Merchants Lifestyle Bazaar as they have gathered their best items up for grabs this Yuletide season. From branded apparel for the whole family to Ready To Wear ( RTW) overruns, scents and perfume and also Korean Hallyu merchandise as a perfect gift for the family this Christmas will be readily available at discounted prices. Pasalubong items and assorted kakanins along with other foodies finds for your foodie friends are also available in the bazaar! And make sure to look for that perfect kikay kit for your BFF or girlfriends at Robinsons Townville Solenad 2 Nuvali! Along with the bazaar, on selected weekends there will be special events catered to you and the family. So head on over to Robinsons Townville Solenad 2 Nuvali in Sta. 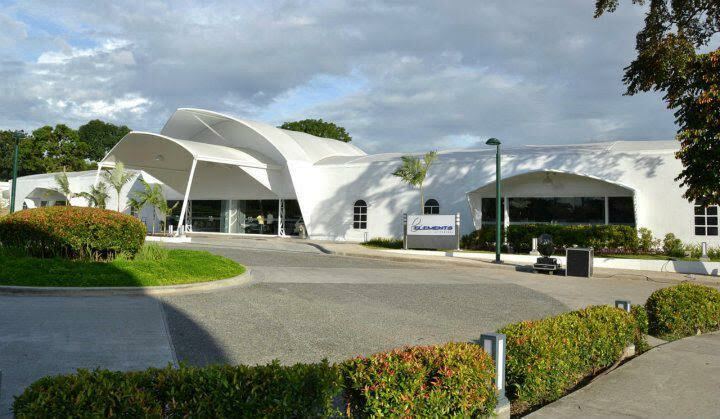 Rosa, Laguna and experience a different kind of Christmas shopping experience with the family! beautifull posting dear shop looks fabulous wish you best in 2018 thanks for sharing.. I'm Nix - A mom who is very passionate with Beauty, Food and Travel. This blog is a place where I can share my thoughts on makeup and how they hold in the Manila Commute. Read about awesome places to dine and relax without spending overboard. For inquiries, collaborations, product reviews, PR, and invites, drop me some mail! All Rights Reserved © 2017 Chic Mix. Design by ReigningStill.